it will be up to that player to PAY for the equipment! Each player will be assigned a locker. PENALTIES--Can't Have Them, Won't Tolerate Them!! TURNOVERS--Every Game We MUST Be At + 1 or Better! TACKLES--90% OF EVERY GAME! If You Never Missed A Tackle, Could You Lose A Game?? TIME OF POSSESION--Control The Clock. Control The Ball, and Don't Let The Other Team Have It. THey Can't Score IF They Don't Have The Ball. ICE PACK TEST--WIN OR LOSE!! We WILL be the toughest team on the field, NOT only defensively, bad offensively, and on special teams. UNITY--WE WIN as a team, and we LOSE AS A TEAM. We are ALL in this together. It's NOT about YOU!! You play for the name ON THE BACK of the jersey!!! 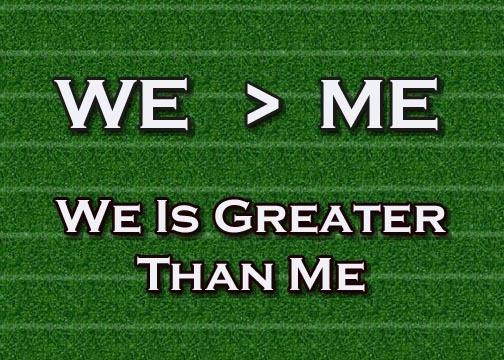 GET BETTER EVERY DAY--IF your'e NOT working to get better, we're ALL getting worse! Have 100% Eligiblity for Thanksgiving Day Game. The way you want to take it off during practice. That great sensation of taking it off afterwards and how good it feels with that sweaty hair that cools you off. The itching of that hot dry summer grass doing the same cool down stretches in the hot afternoon sun later the same day. As Freshman lugging out the tackling dummies before practice, and dragging it all away after practice. What it's like to really give or take a good hard hit, in a game. Sitting in a mud filled bus after a game on a muddy field. The windows all steamed up. The sound of the cleats as players get on the bus and walk down the aisle single file. The many pieces of mud imprinted with cleat marks all over the bus floor. HAZING of Teammates - Suspension from 1 Game to Dismissal from Team. Disrespect to Coaches, Teachers, Game Officials - 1 Game to Dismissal from Team. Walking off or leaving during a game - Dismissal from team. STEALING (from teammates or opponents) Dismissal from team. Getting caught out of school bounds during school hours - 1 Game suspension. you WILL still attend practices for at LEAST one hour. You WIlL also attend all games, ride on the team bus, and wear your game shirt in support of the team. The trainer's room is NOT a "Social Center." Get IN and Get OUT! THE STAND AT THE VARSITY HOME GAMES!!!! !